Thanks to the excellent work of Lucia Hindorff and colleagues at NHGRI, the GWAS catalog provides a great reference for the cumulative results of GWAS for various phenotypes. Anyone familiar with GWAS also likely knows about dbGaP – the NCBI repository for genotype-phenotype relationships – and the wealth of data it contains. While dbGaP is often thought of as a way to get access to existing genotype data, analysis results are often deposited into dbGaP as well. Individual-level data (like genotypes) are generally considered “controlled access”, requiring special permission to retrieve or use. Summary-level data, such as association p-values, are a bit more accessible. There are two tools available from the dbGaP website: the Association Results Browser and the Phenotype-GenotypeIntegrator (PheGenI). These tools provide a search interface for examining previous GWAS associations. 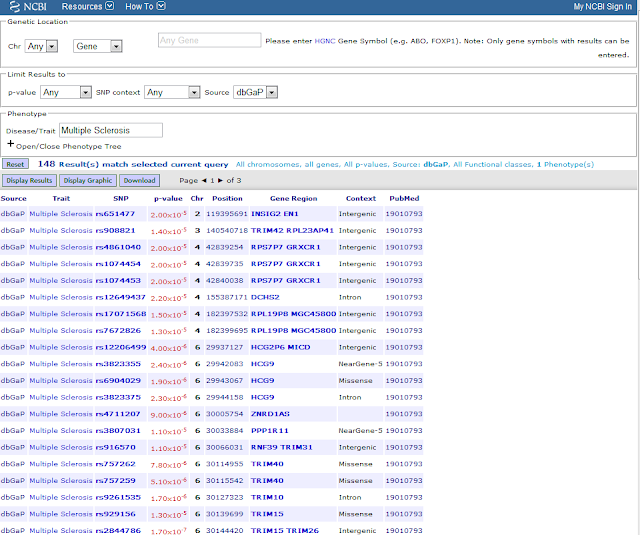 The Association Results Browser provides a simple table listing of associations, searchable by SNP, gene, or phenotype. It contains the information from the NHGRI GWAS catalog, as well as additional associations from dbGaP deposited studies. I’ve shown an example below for multiple sclerosis. You can restrict the search to the dbGaP-specific results by changing the “Source” selection. If you are looking for the impact of a SNP, this is a nice supplement to the catalog. Clicking on a p-value brings up the GaP browser, which provides a more graphical (but perhaps less useful) view of the data. 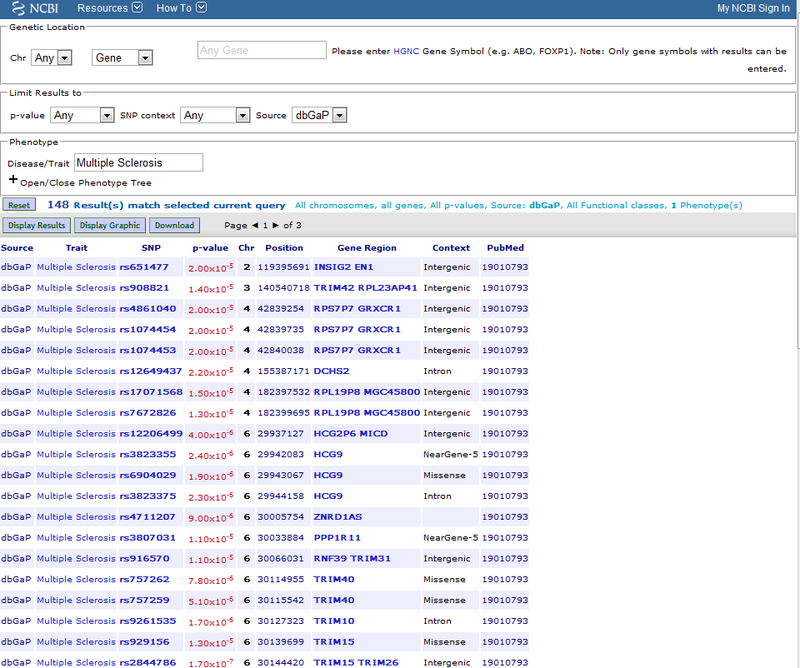 The PheGenI tool provides similar search functionality, but attempts to provide phenotype categories rather than more specific phenotype associations. Essentially, phenotype descriptions are linked to MeSH terms to provide categories such as “Chemicals and Drugs”, or “Hemic and Lymphatic Diseases”. PheGenI seems most useful if searching from the phenotype perspective, while the association browser seems better for SNP or Gene searches. All these tools are under active development, and I look forward to seeing their future versions.